Continuing Education Units DPR and CCA were requested. Tomato spotted wilt virus (TSWV) is a persistent challenge faced by tomato producers. This virus is transmitted by thrips and has many weed and crop hosts. 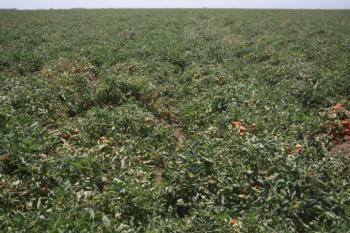 It causes economic losses in several crops that include processing and fresh market tomatoes. An IPM program to limit damage caused by TSWV includes sanitation, site selection, thrips control and plant resistance. However, in 2016, a strain of the virus caused disease in tomato varieties with the TSWV resistance gene (SW5) in Fresno County. Similar SW5 resistance-breaking strains were documented in Europe and other parts of the world, but this is the first report in the Continental United States. This strain increased in distribution over the past two years and was detected in processing and fresh market tomatoes as well as in celery, lettuce, pepper and sow thistle. In Mar 2018, the SW5 resistance-breaking strain was detected in Fresno County lettuce, which provides evidence that it is likely to remain a challenge to producers. Control strategies should make use of multiple tactics without total reliance on any one management approach. Beet leafhoppers have been detected in western Fresno and Kings Counties. To get the most recent reports from the California Department of Food and Agriculture's Beet curly top virus Control Program, go to the following link: Curly Top Virus Report”. Vegetable crop production is an important component of agricultural production in Fresno County. The UCCE vegetable crops program addresses critical production issues in large scale vegetable crops, which includes processing and fresh market tomatoes, garlic, onions and lettuce. The function of the vegetable crops Advisor is to address critical issues related to vegetable crop production through development and interpretation of science-based information. The focus of this program is on increasing efficiencies and sustainability of vegetable crop production through optimizing cultural practices, resource management and pest management. The report estimates costs and returns and provides an overview of common production practices related to irrigation, fertility and pest management of processing tomatoes. In this report, some specifics are assumed, and calculations are based on a hypothetical well-managed farming operation described in detail. Net profits are calculated relative to a range of yields and prices. Monthly cash costs, hourly equipment costs, operational annual equipment, investment and business overhead costs are included. The authors received input and reviews from UC ANR Cooperative Extension vegetable crops advisors and other agricultural associates. The new study, “Sample Costs to Produce Processing Tomatoes in the San Joaquin Valley South, Fresno County – 2018,” can be downloaded for free from the UC Davis Department of Agricultural and Resource Economics website at http://coststudies.ucdavis.edu.